If you are looking for something unique and out of the ordinary to do on 31st March, British International School Bratislava would like to invite you to the Nord Anglia Performing Arts Festival 2019- Concert. 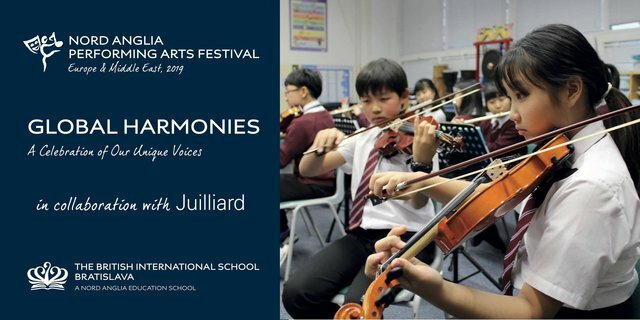 The Nord Anglia Performing Arts Festival will bring young musicians ages 8–18 together from 13 different Nord Anglia Education schools in Europe and the Middle East to collaborate, create and perform outstanding music. Students will build relationships and expand their musicianship. The festival will culminate in a concert performance at the iconic Slovak National Radio Building in central Bratislava. You can look forward to almost 200 young students coming from 13 international schools performing together on one stage. Bring your friends and family to enjoy a Sunday afternoon with quality music performances and support young talents from different parts of the world.